The bulbous red caviar is almost gone from a large goblet. 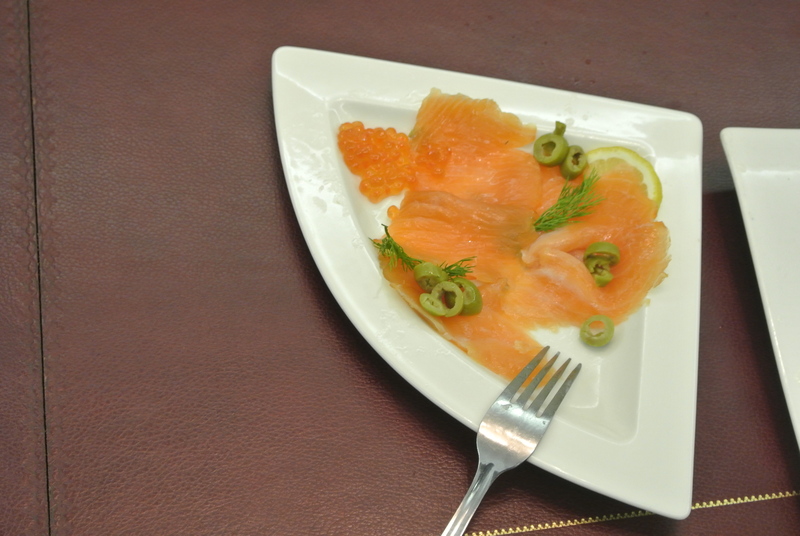 But there is plenty of smoked salmon on the table. Russia’s chief rabbi, Berel Lazar, has stepped out for a brief phone call. A half dozen people wait for him in the hall. 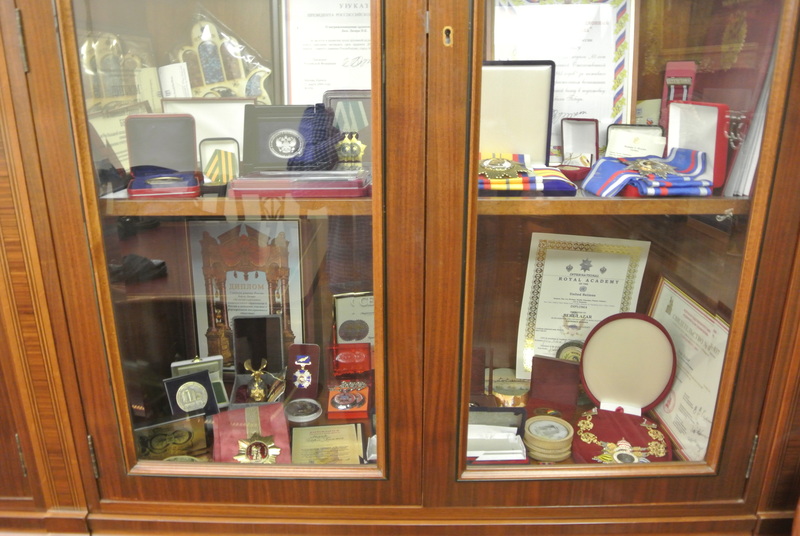 The meeting room is decorated with stately paintings of rabbis, Jewish ritual objects and awards he has won over the years. Some of the medals look more appropriate to a 19th-century event at Versailles than the modern period. It is a far cry from the threadbare years of the 1980s, when Lazar was dispatched by Chabad leader Rabbi Menachem Schneerson to serve the Jews of what Ronald Reagan was then calling the “Evil Empire.” Ensconced at Maryina Roshcha, a large complex that houses a synagogue and two dining halls, the rabbi presides over more than 150,000 Jews in the Russian Federation. Down the street is a large new state-of-the-art Jewish museum, which opened in 2012 with the personal support of Russian President Vladimir Putin. Trolleys that clink past – they don’t seem much changed from the Soviet era – have “Evrisckie Musee” (“Hebrew Museum”) emblazoned on them in Cyrillic. A few seminary girls, one from Siberia and another from Belarus, walk down the street outside the synagogue. On the same week that I am speaking with Lazar, Limmud FSU is hosting a massive gathering of more than 1,200 young professionals outside of the capital. 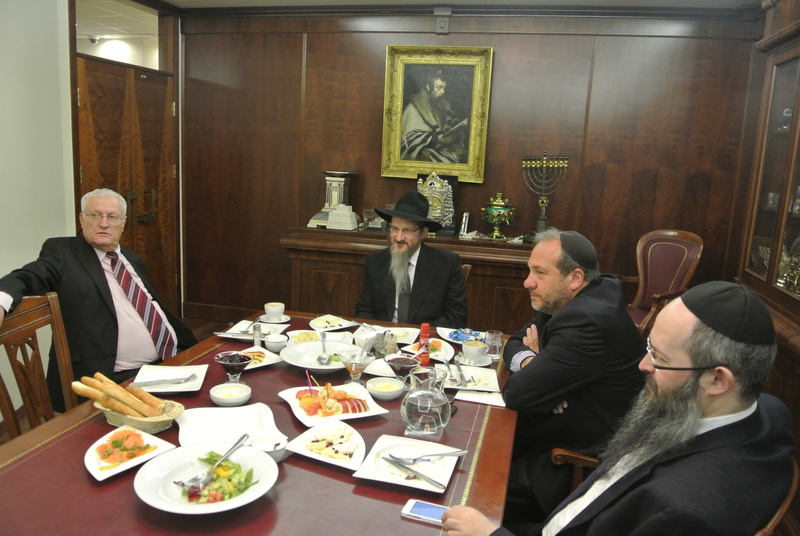 Lazar has just finished a meeting with Chaim Chesler, the founder of Limmud FSU, and Rabbi Yechiel Eckstein, founder of the International Fellowship of Christians and Jews. Just before they leave, he regales them with a tale that might have come from one of the renowned hassidic masters. Last July, on the anniversary of the Battle of Kursk in 1943, the chief rabbi was asked to attend events in southwestern Russia. Kursk was the largest tank battle in history, and when the Soviet legions had broken the back of the Nazis there, the Nazi menace would never again threaten the motherland. Many Jews had fought in these battles (around half of the Jews of the USSR perished in the war years, either in fighting or due to the Holocaust), so the rabbi’s presence was part of commemorating all the groups who suffered. Government functionaries promised to return him before Shabbat. But the plane was delayed, and he made it back just as Shabbat was coming in. Rejecting various other ideas, he decided to walk. And so the wiry-framed rabbi trudged 30 kilometers into Moscow. Berel Lazar was born in Italy to a Chabad family. He speaks seven languages, including Yiddish with his children and English with his American- born wife. He has been the chief rabbi since 2000. 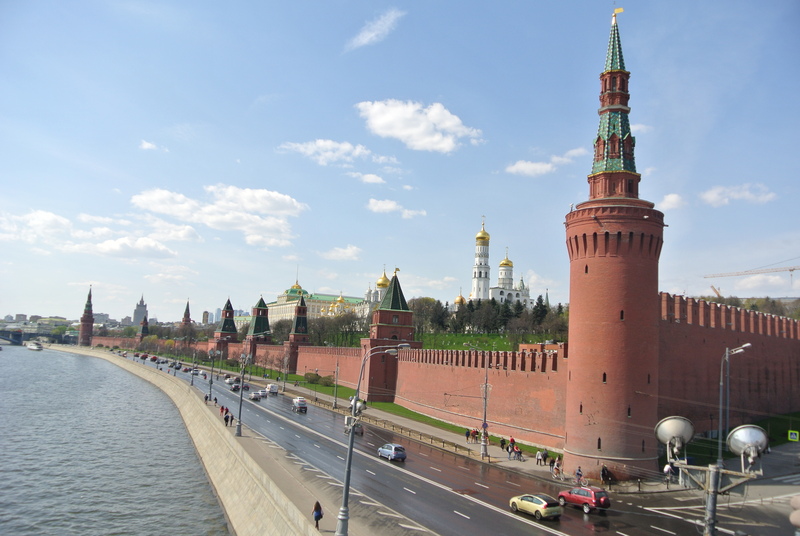 With the backdrop of a crisis in Ukraine, he sits down to discuss the state of Russian Jewry. What is the situation of Jews in Russia today? We believe there are more than a million Jews. Sadly, the majority of them have no connection to the Jewish community – they are completely assimilated and don’t know what it means to be Jewish. We had one boy on a trip whose mother passed away, and the grandfather told him, “whatever you do, don’t put a cross,” and they pressured him and said that his grandma was Jewish and her last request was not to put a cross on the grave. He didn’t know what it is to be Jewish, and his non-Jewish girlfriend convinced him to have a circumcision and go to synagogue afterward. People find out they are Jewish. They want to get involved. The biggest danger for Russian Jews is to lose these people. We are on our last wagon to catch them. Once the grandparents die, they will not know they are Jewish. Seventy to 80 years of Communism left a strong, deep wound in our community. Our main goal is to portray Judaism as something positive, exciting, happy, enjoyable, meaningful. And people should understand that being Jewish is not something to be ashamed of but proud of. Everyone will feel it is something good, and will decide how to get involved. Some will learn or keep kosher, others will be interested in being part of the community – each one will go at his speed and his level. At least they will be somehow connected to being Jewish. That is the biggest danger: that it [their Jewishness] will be forgotten, that it fades away. Many people are intermarried? People married not by choice, not due to knowledge, but because they felt it was the only way out. Like the anusim [Jews who were forced to convert to Christianity in Europe], they felt forced into it. Once, a lady came over to me and said she married a non-Jew and her grandma married a non-Jew and her mother married a non-Jew because they didn’t want the children to suffer as they suffered. They wanted to assimilate. It wasn’t that they married because they couldn’t meet Jews. But even that didn’t work. We want to find a solution for them. We want to keep the Jewish part of the family. We don’t want to tell them they are no good. We have a beit din [rabbinical court] that deals with conversions; we are very open to them. We don’t cut corners, but we are an open-minded community. How did you come to Russia? I was born in Milan and raised in a Chabad family. My parents were shluhim [Chabad emissaries] in Italy. After the war, they moved to the US and grew up there. I grew up in Italy and learned in the States. I was asked to come teach refuseniks in 1986 and the years after that. 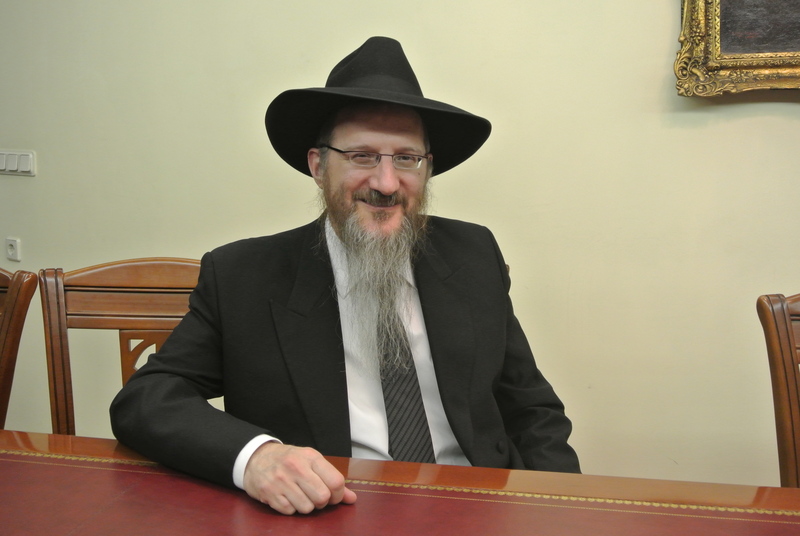 After I got married, I was invited by the community [in Moscow] to become the rabbi. There was nothing there then; they had to bring a rabbi from abroad. They knew me from before. There were no synagogues then. I asked the [Chabad] rebbe, and he gave his blessing. I was sent here in 1990. I came to rebuild the community. It had gone through heroic struggles to stay alive. It was very hurt. It was traumatized. People were afraid to show their Jewishness. Even to put a small advertisement in the newspaper to announce Rosh Hashana made them think a pogrom would come. They thought to dress like a Jew in the streets was scary. They had to hear that things were changing. [They thought] to put up a menorah in Red Square was suicide. Going to the government and inviting the president [was controversial]. People had to get used to the idea [of being openly Jewish]. Today, baruch hashem, Jews are not ashamed anymore, and they are ready to walk in the streets and wear a kippa, and they don’t fear to tell people they are part of the community. In the 1990s, Communism collapsed, and due to the immigration to the West, the community evaporated. But what I saw at Limmud was a sort of rebirth of a new generation that has grown up since 1990, born after Communism. So is this the community you work with? You truly understand the situation. Anyone who had any connection to Jewishness left for Israel or America. Those who were left here did not care or were not involved; Judaism was the last thing on their minds. There was nothing to eat and do, no security, no future. The ones who didn’t leave were far away from anything Jewish. America sort of closed the doors. Israel was the only place to go. I remember in 1993-1995, working here was like sitting in a train station – they were making some circumcisions and getting married, and then every day we were going to the train station to say goodbye to them. They were leaving. It didn’t look like there would be a local community. Our dream was to build something here. In 1993-1996, this place was really empty. To get a minyan [quorum of 10 for prayers], we used to stand in the streets asking people to join the minyan. When we opened this building, no one thought that it would become full or used. There used to be a wooden building here, the only synagogue built under Communism, and it burnt down in 1993. And we rebuilt this community center. It used to be a traditional Jewish area a long time ago. Maryina Roshcha was the name of the area, it was called “Banditski” [an area inhabited by bandits or bad people after the Jewish community had moved out of the neighborhood]. Are there new developments in the community? Is it strengthening? Do you see growth? We see miracles every day. We see more and more people getting involved, changing their lives. It is a 180-degree change. For some, it is heroic. People will lose jobs to keep Shabbat. The risks they take to become part of the community, the amount of support we get, most activities are from local support. We never dreamt such a thing might happen. We have good relationships with everyone. With this meeting with Limmud, there was not too much cooperation. I’m not sure why. I know Chaim Chesler 15-20 years. But with every other Jewish organization we have events and programs, coordination – with the Jewish Agency, with Joint. It is a community that is in its diapers and growing and building. It is very young, a 20-year-old community. It is not like these established communities. Time will show how interconnected. In general, there is a good relationship. Openness. Understanding, respect. [The rabbi also notes that the community oversees the production of 120 tons of kosher meat a month and supplies 10,000 meals to airline travelers. What is the relationship with secular Jews? On Shabbat, you find the crowd is 70-80 percent what would be called secular. We had a Seder for 2,000 people. The vast majority is non-religious, but each one is taking some step in the right direction. Some learn, some practice something – Yom Kippur, Shabbat – starting from zero. You are not talking about an established Orthodox community. When you see these young kids, the first generation born under freedom, they are all starting. Each one takes steps in the right direction. Ninety percent ate matza on Passover. Fifty percent had a circumcision, though not at eight days old. We have a mohel who has done 6,000 adult circumcisions over 10 years, a few hundred of them for newborns. Do some Jews come back from Israel and the West? It is strengthening [our community]; when they left they said “never again,” they said it was a cursed place, and now they come back and feel wanted and comfortable. They can have a Jewish education and kosher food. They find jobs and universities, which in the past was hard. Many are very involved [with the community] due to their involvement in the West. How does the Jewish community deal with anti-Semitism? Is it an issue? We always monitor it and keep our eyes and ears open. You have to always keep your thumb on the pulse; we have to know that anything could happen, any day, any time. There are some anti-Semitic forces in Russia. The good side is that there was a very clear directive from the government on zero tolerance of anti-Semitism – no tolerance for any political party or leader using anti-Semitism to gain votes. There are much fewer anti-Semitic acts because of harsh punishments on those who were caught. In the old days, people were not brought to justice. Some of those [convicted more recently] were punished very severely; the punishment is much higher for hooliganism [than it used to be]. It is a fact that anti-Semitism has dropped strongly; still a way to go, still fighting. I don’t feel anti-Semitism [for dressing in traditional Jewish clothes]. We had stabbings and attacks on this synagogue years ago, but there have not been serious attacks for years. Does the Jewish community receive close support from the government, particularly President Putin? Some people have called you “Putin’s rabbi,” and criticized you for being too close to the President? I don’t think Putin needs a rabbi. I don’t know what the critics mean. Because he comes to the museum twice or comes to the opening, or speaks highly of the Jewish community? We don’t deal with the international policy of Russia. What Putin has done is remarkable. He is the first president ever who visited the Jewish community. Just a small example: there is a yearly exam in Russia called the “Idinia Gusudarsnki Exam,” a standardized test, and it is on the same time, same day [for everyone]. And this year it fell on Shavuot, and only because of the president’s goodwill, he made a special exception for the Jews. Show me any other country in Europe that will go out of their way [to do something similar]. So you are saying that if this was any other country, where the president showed such support for the Jewish community it would not be criticized, but praised? This is just an example. Whether it is returning synagogue buildings, or supporting private schools for Jews, or the Jewish museum, there is full [government] support for anything related to traditional religious practice and rituals, such as kosher slaughter, circumcision. Maybe Russia is not as good on human rights or other freedoms. What is your view on the Ukraine issue? We are not divided from the Jewish community there. We are close to our brothers there and rabbis there. We continue to help them. With some rabbis there, I do disagree. There was an interview with [Israeli Foreign Minister Avigdor] Liberman; they asked him why Israel is not involved and he said there are enough issues [for Israel to deal with elsewhere] and he said, “let the other players get involved.” I feel the same about the local community: it should not get involved in this issue. It doesn’t concern us. We have to worry about rebuilding the Jewish community. [When there is] anti-Semitism, we have to speak up. No one is at fault, but because of the anarchy, Jews have been suffering, whether it is the leaflets in Donetsk, or Molotov [cocktails] in Nikolaev, or desecrations of graves. The Jews and minorities suffer when there is chaos. We have to be aware and monitor and speak up about it. Whether what Russia or Ukraine or EU did is right or wrong is not our issue and we should not get involved in these issues.